These strategies form the key distinctions between people who are what I call “Membership Marketers” and those who are “Member Leaders.” Membership Marketers focus only on the hunt, acquiring new members. Member Leaders are as concerned with keeping the members they have as they are with getting new ones. Member Leaders implement systems to get their members to the Retention Point as quickly as possible. The Retention Point is when members fall in love with you, buy everything you offer and eagerly refer their friends. Chances are, this is already happening a little. You likely have some of these members already. These 10 marketing strategies help you generate more of those Lifers increasing your average member value. And, help you convert some of your Quitters into Lifers to decrease churn, increase retention and grow your recurring revenue. VALUE is like water; too much is just as bad as too little. Membership Marketers fear someone won’t buy, so they try to stack up more and more stuff to make an offer the person cannot refuse. Member Leaders look ahead a few steps and focus their marketing on solving a problem for their prospective member and delivering exactly what they need to experience a victory. EVERY member contact is a sales communication. You are competing against a barrage of free stuff, thousands of media outlets, and millions of smartphone apps for your customers’ attention. This month’s deliverable is a sales letter to stay until next month. Every communication must be written as a sales presentation to capture and keep attention and to elevate the importance of what you deliver. Membership Marketers get so fancy with their copywriting that they lose sight of what’s really important. Membership is about connecting on a set of shared values, a vision about what the world should be like, and a mission to improve the world by improving the people within it. Member Leaders focus as much time on this as they do the stuff they deliver. Your relationship begins AFTER you make the sale. Have you ever had a great conversation with someone and really connected with them, but then they never called you and barely even acknowledged you? How did that feel? Membership Marketers spend more time romancing people who haven’t given them money yet. Member Leaders instead invest their time and energy building relationships with their paid members. Member On Ramp gets new members up to speed. When you start binge-watching a new show on Netflix, what episode do you begin with? Do you start with season three, episode five? Of course not; you’d be all confused as to who the characters were and what was going on. Instead, you begin with season one, episode one. Where do you begin your new members? Do you begin them with communication that helps them get up to speed on who you are, what you stand for, and the values of your community? Or do you just ship them what you happen to be shipping everyone else? Your Member On Ramp gets your new members up to speed so they can become Lifers. Solve problems to deliver member TRANSFORMATIONS. None of your members woke up this morning thinking to themselves, “I hope today is the day I get an email.” Most people have too many already. So when your email arrives, how do you get members to take their finger off the delete button and double-click to open your email full-screen to read every word? Make what you deliver about solving problems for your members. Your VALUE is the feelings you deliver, not the stuff. The Harley-Davidson dealers in Florida have been my client since 2003, so I do cooperative marketing and deliver training for their people. Half of all motorcycles sold today are Harley-Davidsons, and Harleys are the premium product. Do Harleys get you to your destination faster? No; Harley’s dominate their category because of the way they make their customers feel about them versus their competitors. Membership Marketers emulate Honda, focusing on the engineering of what they create and deliver at the lowest possible price. Member Leaders emulate Harley-Davidson to focus on how their customers feel about their product. Go look at the email you send your brand-new members — yes, that confirmation email that goes out automatically. How many times does it use the words, “I,” “me,” “we,” or mention your company’s name? Now look at how many times the word “you” occurs. Rewrite that email using ONLY the word “you.” Now rewrite everything else, making it about your member rather than about you and what you deliver. How do we compensate teachers in our society versus leaders? Which compensation package do you want? Teachers focus on lessons, curriculum, and minutia. Leaders draw your attention to what’s important in your life, give you a new perspective on old problems, and remove obstacles in your life you didn’t realize were there. There are thousands of hours of podcasts on iTunes and millions of hours of free video on YouTube with people eagerly teaching for free. And yet we have a huge deficit of leaders. Begin by promoting the END. Your members get bogged down and discouraged when the struggle of what to do becomes more vivid than the outcome they are looking to achieve. Help inspire your members to action by helping them see their dreams and what life will be like after their problems are solved as vividly as possible. Make their dreams bigger than their problems, and they’ll skip right over those problems to become your member for life. 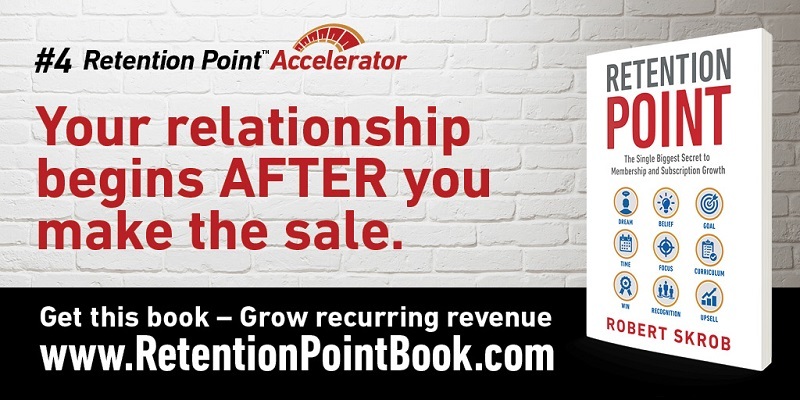 My book, Retention Point, reveals exactly how to break through that growth plateau (or avoid it altogether), stop your members from quitting, attract more new members, and grow your recurring revenue. While you are thinking about it and before you do anything else, visit Amazon.com or visit www.RetentionPointBook.com to grab your copy today.